Daily Illuminator: GURPS At Your Favorite Local Game Store! July 27, 2017: GURPS At Your Favorite Local Game Store! 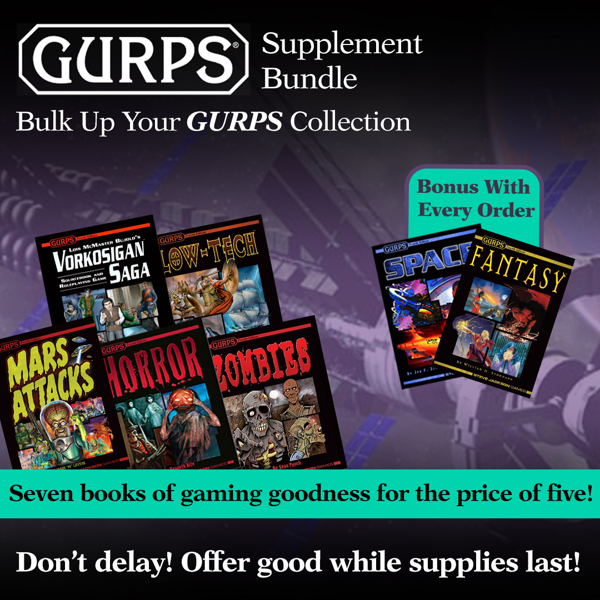 You may remember that, not too long ago, we ran a special bundle of GURPS books as a pre-order at Warehouse 23. (Ten books with just one buy button? Sweet!) Well, our partners at Alliance noticed and asked us one question: Can we join in on the fun? Good news, everybody! Alliance offered the same pre-order GURPS bundle to their retailers, so we can happily report that the recent GURPS print-on-demand softcovers will find their way into dozens of stores. This means a larger GURPS library at those stores, which should help generate some renewed interest in GURPS as we grow closer to the release of the Dungeon Fantasy box set this fall. Thank you to Alliance for stepping up and working with us to get these bundles into retailers' hands. We appreciate the support and look forward to collaborating on more bundles shortly.